When you visit Greece, one place you can’t miss is Mykonos…and you can’t just pop in and out for a day trip. With its beach clubs, non-stop parties, and idyllic daybed lounging by the Aegean Sea, this glitzy hotspot island needs to be experienced for days on end. So, where should you stay when you go? 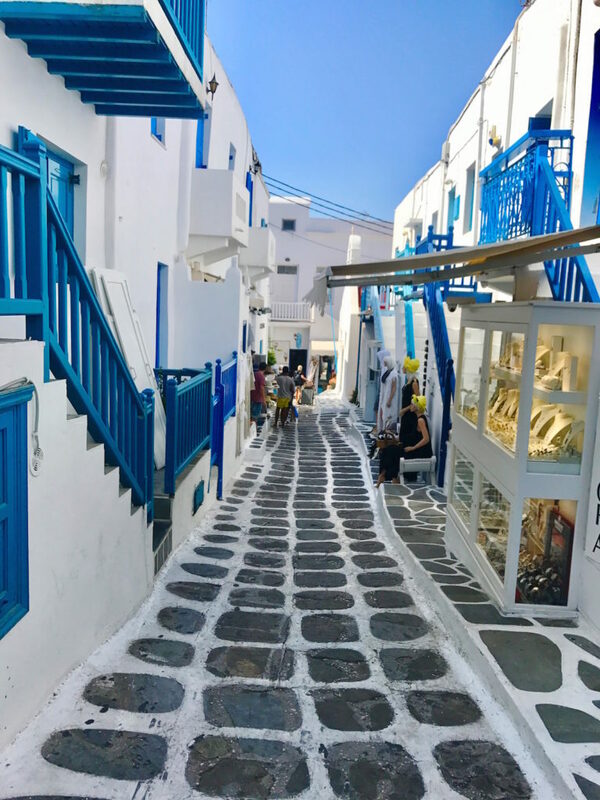 If you like to be in the center of the action, you can’t go wrong with Mykonos Town – the island’s capital. Staying right in the center of town can be a bit overwhelming because of the non-stop partying and bustling vibe though, so try to go with a hotel that’s a short walk or drive from it if that might bother you. For those who want a more romantic vibe, consider staying on Psauro, Kavo Livadi, or Paraga Beach. Psauro’s gorgeous teal waters have made it one of the most popular beaches on the island and it is home to famed party hotspot Nammos Beach Club and restuarant. Paraga and Kavo Livadi Beach are also great options for those looking for more affordable digs. During the day, both are laid back and there are huge daybeds at hotspots like Nemo Beach Club that are much more affordable than those closer to Mykonos Town (like Nammos in Psauro). 1. Tharroe of Mykonos: We stayed at this cozy hillside boutique hotel, located just a short drive down to Mykonos Town, and fell in love with its panoramic seaside views from the sparkling pool and the on-site restaurant with cocktails and small bites to die for. The staff is also very helpful, will make dinner reservations for you (which you’ll need), and pointed us to a beach that we fell in love with. Big Tip: Don’t get stuck on locking down a room with a seaside view, particularly when you can walk right out to the pool and get a far better one. Instead, go for the more budget-friendly garden view room. We originally chose a room with a seaside view, but had to switch it upon arrival because it was way too small. Our garden view room was twice the size. Deluxe Sea view room. You can have a relaxing bubble bath in the jacuzzi bathtub and afterwards enjoy the view of the mykonian windmills and the mediterranean sea from your own bed! 2. Grace Mykonos: Located just north of Mykonos Town, this boutique luxury hotel is perfect for those who like to be in the center of the action – but just far enough away from it when it’s time to call it a night. The Grace overlooks Agios Stefanos beach, has an on-site spa, and an acclaimed restaurant that serves up Mediterranean grub and daily breakfast. While each room comes with plush white bedding and walk-in showers, there is one amenity the hotel offers that makes it worth it to spend a little more. Book a room with a temperature-controlled plunge pool and it may be tough to leave. 3. Myconian Utopia: We usually don’t recommend staying too far outside of the main hub of Mykonos Town (there’s so much that we want you to experience), but this luxury hotel makes it worth it. Located about a 25-minute drive away from Mykonos Town above Elia Beach, Myconian Utopia is perfect for couples and honeymooners who want to kick back and relax in Mykonos in their own oasis. It has it all – from its dreamy infinity pool to luxury suites and villas and breakfast with views of the Aegean sea at its Pavilion restaurant. A Destination Fabber stayed here after popping the question to his fiancè and told us it was the best hotel he’s ever stayed in. Myconian Utopia – you have our vote too. 4. Belvedere Hotel: With it’s pool party vibes, chic digs, and a short walk to all of the nightlife and restaurants in Mykonos Town, this boutique luxury hotel continues to be a top pick among Mykonos travelers. In addition to its location and in-house party, the Belvedere also has dining and bar options. 5. Poseidon Hotel: This Mykonos hotel is just a short walk from downtown Mykonos and is one of the more budget-friendly options on the island. 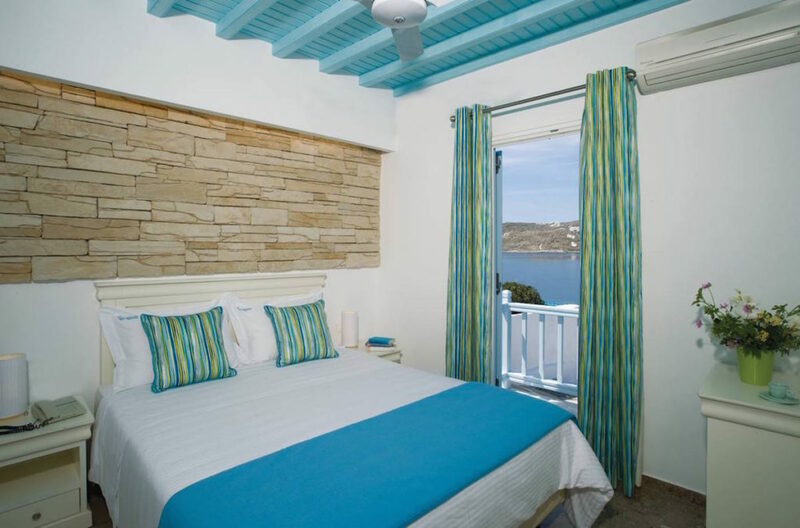 All rooms come with balconies, pastel Cycladic stylings, flat-screen TVs, and AC. Guests tend to nosh on the pool bar’s meals while soaking up the sun by the pool, and also rave about the breakfasts served up there. Big Tip: There is no on-site restaurant, but it’s hard to be the central location. 6. Bill and Coo Suites: When you’re looking for luxury, it’s tough to beat the trendy Bill and Coo Suites, which sits right above Mykonos Town. The sunset views at its gorgeous infinity pool have made it a fave among jetsetters, who take a short walk or taxi to Mykonos Town to party the night away, or stay on site and feast at the hotel’s famed restaurant, which serves up delicious Mediterranean grub and kitschy seafood concoctions. Big Tip: Don’t miss it’s stylish sister hotel Bill and Coo Coast, located on the quieter beach town of Agios Ioannis. It’s just a 10-minute drive from Mykonos Town and each of the 15 suites have sea views and glass waterfall showers. As a bonus, the hotel also offers VIP services like luxury yacht transfers. 7. Mykonos Blu: If you don’t want to stay in the hub of Mykonos Town, Mykonos Blu is an incredible option. Located on Psarou Beach, this hub of bungalows and villas is just a 5-minute walk from the shore and has a 2-level infinity pool. Some of the units have private pools and indoor/outdoor bathtubs, and phototherapy showers (how cool is that?!). Guests can also nosh on Mediterranean and seafood grub at Aegean Poets, and order poolside lunches and drinks from the L’Archipel brasserie. After dinner, guests can kick back at the Delos Lounge Bar. And yes, there’s a spa.